2-10-05 "Sled dog racing – the “Gilford” connection"
Wintertime is a perfect time to reminisce about winters past. Marge Muehlke did so this past week in respect to "skiing on the west side", so this week seems an opportune time to turn our attention to "sled dog racing - the 'Gilford' connection". Let's start by gaining some historical perspective. Where might people live to reasonably come up with the idea of pairing up dogs and sleds to provide transportation? In a snowy climate -- such as that of Alaska? Of course! And, so it did happen, thanks to the resourcefulness of Eskimos who lived there. The 1897 discovery of gold on the Klondike River in Yukon Territory set off the gold rush of 1898 into Alaska which at that time was a territory of the United States. Interaction with the Eskimo way of life was a natural byproduct. Twenty-eight years later, in 1925, a medical emergency - an outbreak of diphtheria (a highly contagious respiratory disease) - triggered a cooperative effort that had far-reaching effects. To curtail the diphtheria epidemic, antitoxin serum had to be raced to Nome, Alaska. It was January 27, a time of year when the landscape was covered in deep snow and ice and the temperatures were frigid. In this "race against death", the hope and trust to get the serum through on time would rely on a relay format using dog sleds. Word went out and mushers volunteered. These volunteers included the natives of Alaska as well as men who had moved to Alaska from other countries. The successful 1925 Nome Serum Run, which began on January 27 and concluded on February 1st, involved team work which included twenty-one mushers and their dog teams to cover 674 miles during a total time of 127.5 hours. 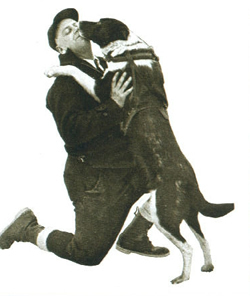 Two of the legendary participants were Leonhard Seppala and Gunnar Kaason, whose respective lead dogs were Togo and Balto. It is no wonder that the 1925 Nome Serum Run made nationwide headlines and caught the attention of many a New Hampshirite! Arthur Waldron of Wonalancet's Chinook Kennels is attributed to have been the force behind developing the 200-mile long point-to-point sled dog race which was run between Berlin, New Hampshire and Boston, Massachusetts - a race that only passed through the Lakes Region area. The first sled dog race held in our vacinity was part of Laconia's 1926 Winter Carnival. The race was between a team from Meredith and one owned by Belmont resident Charlie Lyman. Charlie, who operated a barbershop in Laconia, in time became known as "Laconia's Mister Sled Dog". His interest in and passion for sled dogs and sled dog racing became shared by his whole family, including his son John Lyman, of Gilford, and down through the generations. In 1929 plans for a Laconia Derby - to begin and end in Laconia -- came to fruition under the auspices of the New England Sled Dog Club. A highlight of the event was the arrival of Leonhard Seppala, the fifty-two year old Norwegian musher of Nome, Alaska fame. He and his Siberian Huskies, including his lead dog Togo, arrived by truck from Poland Springs, Maine, a week before Laconia's February 11-13 Derby. A copy of the Citizen's Centennial Edition, which Libby Lyman shared with me recently as we traced the 1929 Laconia Derby's routes, shows Gilford having been involved. The first day of the event was planned so that the 40-mile route would encompass Laconia, Meredith, New Hampton, Bristol, Hill, Sanbornton Square, Lockmere, Winnisquam and then back to the lake in Laconia. Plans for the second day's route included Laconia, Meredith Center, Lakeport, the Country Club to Meredith, Center Harbor, the Long Island Bridge to Glendale, via Lake Winnipesaukee to Steamboat, Bear, Mink and Timber islands, to Lakeport and then back to Laconia. On the third day the race was planned to pass through Laconia, Belmont, Gilmanton Iron Works, Alton, West Alton, Glendale, via the Big Lake. The route was inside Moose, Rattlesnake and Diamond islands. From there the trail led to Gilford Village and then back to Laconia. That year, as well as during many of the subsequent years, including this year, a dirth of snow was a concern. But a snowfall the day before the Derby set the stage for a memorable event and a tradition that continues to this day with throngs of on-lookers turning out to line the race ways. Many a Gilfordite recalls times past when Gilford roads -- then dirt roads with lighter traffic - were the scene of local mushers training their sled dog teams which responded to the command of "Hee!" and "Haw!" partially muffled by a whistling wind. Also, as Marge Muehlke shared in her Steamer article this past week, in 1936, 11-year-old Pete LaBonte's 3-dog team was enlisted to give dog-sled rides to tourists who came to ski on Gunstock Mountain's western slopes. Furthermore, Esther Peters fondly recalls being able to look out her living room window and seeing the mushers put their teams through their paces in the snow-covered fields vacated by dairy cattle during the winter months. Yes, dog sledding which has come to be centered in Laconia certainly shares a connection to Gilford. Libby Lyman, granddaughter of Charlie Lyman and daughter of Pat and John Lyman, has been invited by the Laconia Historical and Museum Society to present the Monday, February 14th program on sled dog racing, a timely presentation with this weekend being on the Community Calendar as Laconia's 76th Annual World Championship Sled Dog Derby. The Lyman family continues to promote and celebrate this aspect of the Lakes Region's cultural heritage.